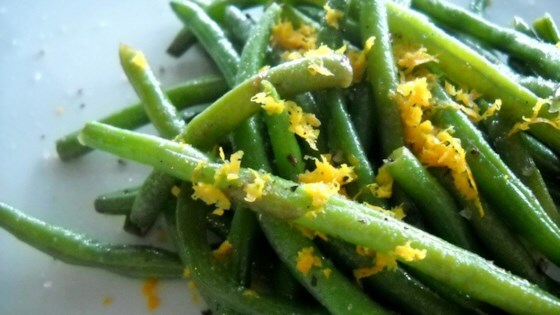 "This is a side dish of fresh green beans tossed with orange-infused olive oil. It's my favorite way to make green beans. I normally serve it with Italian food, it's tasty and refreshing!" Place green beans in a steamer basket over 1 inch of boiling water and cover. Cook until the beans are tender but still firm, 2 to 4 minutes. Drain, and keep warm. Meanwhile, stir together olive oil and 1 tablespoon orange zest strips in a large skillet over medium-low heat. Cook and stir until the olive oil has been infused with the flavor of the orange zest, about 2 minutes. Discard zest strips. Toss drained green beans with flavored olive oil and kosher salt over medium heat until the beans are hot and coated with oil. Place onto a serving dish and sprinkle with remaining 1 teaspoon grated orange zest to garnish. A nice change to ordinary steamed green beans. Easy to make. Next time I'd use more orange zest and a little less oil. I was surprised how flavorful and good-looking this dish was. I used about 3 1/2 teaspoons olive oil, and this seemed to be just right. These were delicious and tender. Great side with roasted potatoes and pork Marsala as in the photo. Easy to make. A simple whole food side dish. Elegant, and rustic all at once. Yummy.